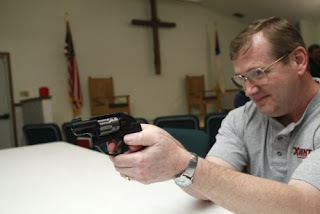 When members of his church use the sanctuary to teach concealed-carry handgun courses, Marengo Christian Church preacher Jeff Copley often stops by. The Morrow County church of 40 to 50 members has been a concealed-carry training site since at least 2004. Church members who have been certified as instructors by the National Rifle Association teach three or four sessions a year. As an associate Pastor and a NRA and Minnesota state firearms instructor, we regularly have firearms and permit to carry training at one of our church campuses. Not only do we have a trained armed safety and security team, and a small group that goes shooting on a regular basis, but we also encourage our congregation to exercise their second amendment rights to bear arms. Thank you for your comments. We have had some healthy conversations regarding guns in church on this website. Can you tell us if you require your members to notify the church if they are carrying? Also you mentioned that you allow this at one of your campuses. Do you have a different policy at other campuses?